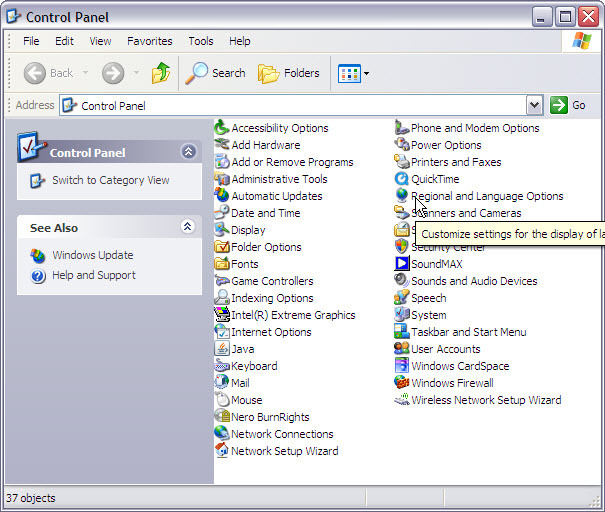 In the Settings tab of the Window that opens click Add. 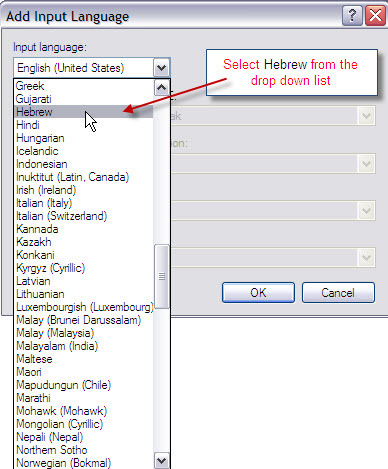 Browse to Hebrew in the list of languages. Click OK to return to Settings tab. Hebrew should now show as an input option in the Settings tab. Click Language Bar... under preferences.. 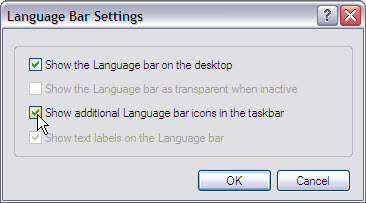 Check the Show Additional Language bar icons in the taskbar box and click OK.
Click Apply to in the Settings tab to confirm your language options and OK. You are now ready to type in Hebrew. 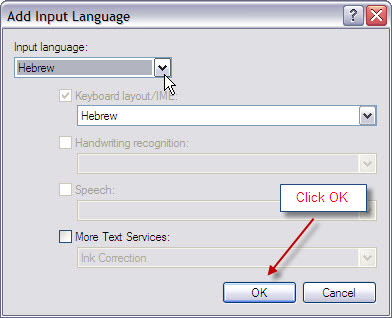 Choose HE to change your language option from English to Hebrew. When you click on EN a menu will appear. 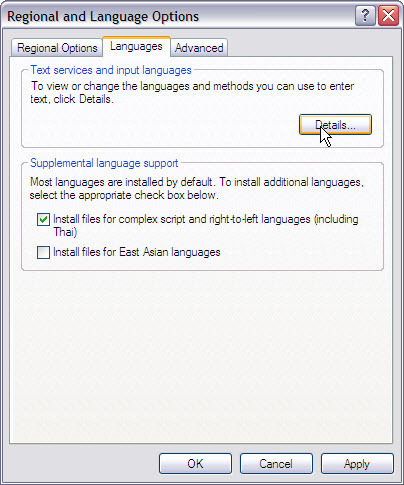 Choose the Language you require. 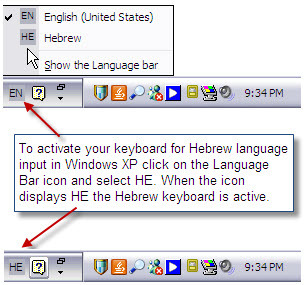 Choosing HE will change your Keyboard input to Hebrew and the Language Bar icon will change to HE. 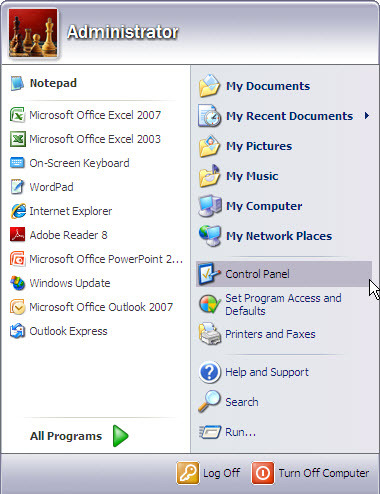 in your Control Panel as described above. You are now ready to type Hebrew using your Hebrew Keyboard. 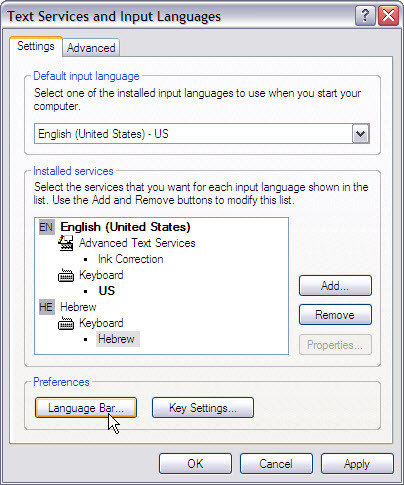 A standard Keyboard Map for Hebrew for a PC can be downloaded HERE. This keyboard maps Hebrew letters [shown in RED] to your keyboard according to the standard keyboard mapping adapted for Hebrew keyboards. This is the Hebrew character layout you will have using the instructions given above. Print, laminate, and keep beside your computer's keyboard for easy reference. 2. the Biblical Hebrew Tiro keyboard which follows the common pattern of the Modern Hebrew keyboard layout used for Israel and Hebrew enabled computers. This layout is the standard layout for Hebrew keyboards in all operating systems. The chart above uses the Biblical Hebrew Tiro keyboard. The Biblical Hebrew keyboards and instructuions are available from the Society of Biblical Literature HERE. The Society also makes available a Hebrew font [SBL Hebrew]. Download the Biblical Hebrew Tiro keyboard driver and manual and follow the instructions provided for installation. Windows Hebrew fonts David, Miriam, FrankRuehl and Rod will display Hebrew consonants but not the diacritical marks mapped to the Biblical Hebrew Tiro keyboard. 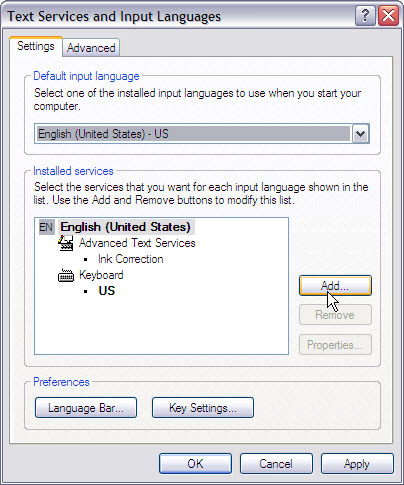 However, all the above fontswill display Hebrew vowels added using the 'LEFT ALT key and the Number Pad' method outlined above.